For those who don’t want to be stuck at home to hand out candy today (or have already partied), the multiplex is a surprisingly good place to rustle up some scares this year. Sure, there’s still a Saw and a remake (The Stepfather), both unseen by me, but there are some good choices out there. First, there’s the low-budget, big box-office, sleeper hit of the fall Paranormal Activity. It’s not a great horror movie but its low-tech effects are all the more scary for being uncomplicated and eerily convincing. It’s a slow-building freak out that grows steadily more frightening as the stakes are raised and the set pieces get scarier. Every night, the lead couple goes to bed. Every night, something weird happens. Through “found footage” the story unspools, with occasional expository clumsiness and a very stupid Ouija Board time-waster, but mostly with unsettling tension. With hype of the “scariest movie ever” variety, I went into the screening ready to prove the hype wrong. For quite a while I had my arms crossed over my chest while thinking “creepy, but not too scary.” By the last third of the movie I was worried I would chew off my bottom lip. It's still not the scariest movie ever, and it's too unsatisfying to be a great movie, but it's good as a horror experience. The movie plays all too well on an elemental fear of the dark and the all-too frightening question: “what happens while you are asleep?” Sure, buckets of blood are startling, but it has nothing on a scream piercing the darkness, jolting a character out of his sleep. Let me tell you, that scream haunted my ears for days. On a less intense, but even more entertaining, note there’s Zombieland, a zom-com in the vein of the subgenre classic Shaun of the Dead. This film is a bit less great than that one, but it’s still a raucous haunted-hay-ride of a movie. Four survivors of a zombie apocalypse team up to go cross country. A typically odd mish-mash of character types, the group consists of a macho-man survivalist (Woody Harrelson), a nerdy agoraphobic (Jesse Eisenberg), and a young woman (Emma Stone) and her younger sister (Abigail Breslin). Together, they get in to all kinds of wacky adventures and close-calls, not unlike a normal zombie movie but played with a lighter, nimbler, tone. What prevents the movie from being standard and routine are the marvelous comedic performances from all involved, helped tremendously by an uncomplicated and funny script that sails along at a breakneck speed with plenty of wit and good-nature. First-time director Ruben Fleischer directs with a light touch and an enjoyably creative visual style. Zombieland may not be all that scary, but it’s a blast. 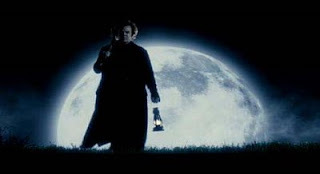 As for Cirque du Freak: The Vampire’s Assistant, it gets a much more qualified recommendation from me. It’s based on the first three volumes of a book series, and it consequentially feels rushed and cluttered, with almost too many underdeveloped characters for its own good. It’s also a movie that has way more wind-up than pitch, with one eye always on a sequel. However, director Paul Weitz (is he jealous his brother Chris has the Twilight sequel next month?) directs with just enough likable style and his cast, especially John C. Reilly as the titular vampire, young newcomer Chris Massoglia as the titular assistant, and Josh Hutcherson as the budding baddie, is just endearing enough that the movie squeaks by. It’s no great thing, but it was an enjoyable distraction on the lazy Saturday afternoon when I caught the matinee. 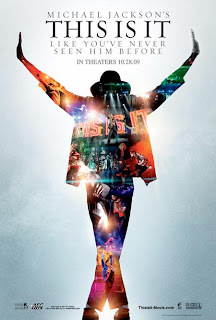 I went in to This is It with some skepticism, fearing a rushed posthumous cash-grab hagiography of Michael Jackson. Those fears were unfounded. This is a fun and exciting, moving and haunting film, a behind-the-scenes look at rehearsals for a comeback concert cancelled by the death of its star. The tragedy is not unseemly lingered upon; in fact, it’s only implied to have happened. 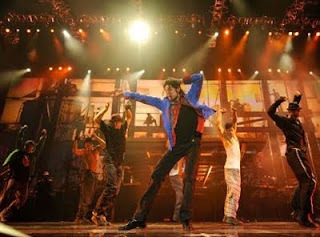 Instead, Kenny Ortega, the man directing the concert who subsequently took on the task of piecing together the film, has assembled the footage from rehearsals and organized it to give a glimpse of what the concert would have been. Luckily, Jackson does not appear as a drugged-out shell of a performer. He could still dance and sing, if not quite at the same level he was at in the mid-80s. There's an amazing degree of precision in his motions and control in his voice. He wouldn’t have embarrassed himself, but I couldn’t help but wonder if 50 of these shows would have been too many, given the amazing physicality involved. He’s sometimes saving his voice for the big show, but other times he gets caught up in the moment and sings right out. Many of the numbers, even in this raw unpolished form, raised goosebumps. There's a tender version of "Human Nature," a nearly anthemic "Billie Jean," a goofy fun "Thriller," a fiery "Beat It," and a total blast of "Smooth Criminal," among others. It was going to be a great show. The movie’s simplicity, its singularity of focus, could easily be faulted. After all, there is no attempt at providing context and only once – in a montage of old Jackson 5 clips that makes the heart sink to once again see the contrast between the precious little boy and the surgically altered man – is there a nod to his career as an artist. And, of course, there is no mention of the various scandals and eccentricities that made him a cable-news and tabloid staple for the duration of his final decade. But all of this is ultimately to the movie’s credit. It’s better off remaining uncluttered, positioned admirably between whitewashing and muckraking. It’s not warts-and-all but it’s not totally uncritical. Ortega, while still remaining respectful, shows enough missed notes, false starts and bobbled lyrics to show that Jackson was indeed a human being. The focus is totally on the music, the performance, the planning. This is an intriguing look inside the artistic process, a look that reveals Jackson and his supporting technicians, musicians, and dancers as consummate professionals, eager and excited to put on a great concert. We never got that great concert, but at least we now have this movie to forever preserve what could have been. Based on the much-beloved (for good reason) 1963 children’s book by Maurice Sendak, Where the Wild Things Are had much to live up to, a fact not helped by the transcendent short film that was its wildly-acclaimed teaser trailer. So it is with great joy, and no small amount of exhilaration, that I can report that Spike Jonze’s film is a gem. It’s a beautiful playground of a movie, wild and rambunctious, scary and sad, fun and funny. It’s not only a great family film and a daringly imaginative piece of filmmaking; it’s also Jonze’s best film to date (and that’s saying something after the wildly creative, but totally inappropriate for family viewing, Being John Malkovich and Adaptation). Here kids, and the whole family, are given a great treat. It’s a moving experience and a wonderfully crafted film. Jonze, working from a lovingly adapted screenplay by novelist Dave Eggers, shoots the film with a startling specificity, positioning the camera at the level of a child’s point-of-view, following Max (played very well by young Max Records) as he wanders through his daily life. Jonze and Eggers have said that they didn’t want to “make a children’s movie but a movie about a child.” They have succeeded. The camera can be buoyant or frantically hand-held in one sequence, quiet and still in the next, capturing the rhythms of childhood. It’s down to even the littlest things that the film gets perfectly right: the way Max builds his snow-fort in the opening scene, pausing to sneak a taste; the way he sprawls at the feet of his mother (a warm performance from Catherine Keener) while she works, gently pulling at the toes of her socks; the way he is effortlessly creative and loving, or worried, lonely, and angry. After a temper-tantrum, Max flees into his imagination, finding himself arriving at the shores of a place where Wild Things are. They are massive, fearsome and loveable creatures (perfectly voiced by James Gandolfini, Catherine O’Hara, Chris Cooper, Lauren Ambrose, Paul Dano and Forest Whitaker) who are practically extensions of his personality. Max will be their king, and, difficult though they can be, he will learn to love them. By learning to deal with them, lessons will be learned, but this is thankfully not a story of easy moralizing and empty advice. This is also not a picture-book adaptation that goes overboard with padding out the story with false conflict or unnecessary exposition. (Why did Ron Howard think we needed to see The Grinch as a child?) This is a vibrant, messy, wondrous film with endless charm and invention (not to mention a great soundtrack by Karen O and Carter Burwell). 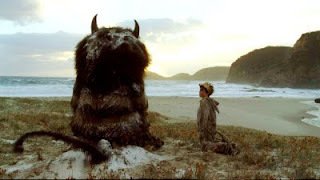 The world of the Wild Things is a realistically fantastical one, with sweeping landscapes (forest and ocean, desert and cliff) both amazing and foreboding. As for the creatures themselves, they are easily identifiable as the ones from the book, their designs perfectly replicated from the illustrations, but they have a surprising tangibility to them thanks to a marvelous mix of puppetry, suits, and CGI, that gives them a sense of weight and warmth. I felt like I could reach out and run my fingers through their fur, feel the warmth of their bodies, sense the vibrations of their thudding footsteps. 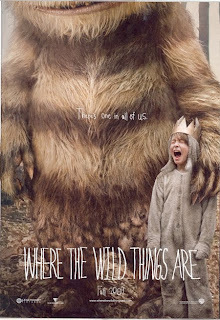 The Wild Things (seemingly more childlike and more adult than Max) have their fun and their foibles, their quirks and the squabbles. The problems and pleasures of these creatures are similar to what we’ve already seen in the life of Max, but it’s not a simple matter of “A” equals “B”, like Ms. Gulch equals the Wicked Witch in The Wizard of Oz. Aspects of personalities and situations are reminiscent, but not identical, to the real world. Max is learning about life through his imaginative play, dreaming perchance to live. Because of the realistic nature of the fantasy, there’s a small sense of danger, as if Max’s imagination could threaten to take over, yet I always sensed that he was safe, because ultimately he was in control of his own fantasy land, thoroughly immersed in it though he may be. Like Max with the Wild Things, the movie is a journey into another viewpoint. It offers the chance to view the world through the eyes of a little boy. It’s a strong sensation, one that could easily be nostalgic, but Jonze and Eggers don’t tip the film in that direction. They know that to be a child is to be small and without control in a world full of people bigger, more powerful than you. Throughout the film, there are several shots of Max looking at those older than him (his sister and her friends, his teacher, his mother and her boyfriend) and we get the sense that he’s staring into a mysterious world only half-comprehensible, so it’s only natural that, to process his feelings, he flees into another mysterious world with large creatures, one that’s only a little easier to understand but one in which he is king. 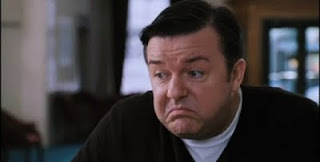 The Invention of Lying comes from the mind of comedian Ricky Gervais (he writes, produces, stars and co-directs) and he has a great hook. What if the human race never discovered lying? At first, the results are hilarious with people dryly pointing out the obvious and sharing innermost thoughts (though why some form of rudimentary manners has also never developed is beyond me). Soon, Gervais discovers he can say something that isn’t (there isn’t even a word for lie) and the comedy moves to a stranger place where he can make just about anything happen because no one has cause to doubt what he says. Unfortunately, even with material this rich, the movie peaks about halfway through, devolving into a depressingly conventional love story that centers around a weak character inhabited by Jennifer Garner. The alternate universe itself becomes tiring, with incessant frankness becoming less tickling and more bludgeoning. To make matters worse, the style of the film’s imagery is nearly suffocating in its blandness. There are some laughs to be found (including one of the funniest scenes of the year) but that just makes the movie’s ultimate failure all the more depressing. Surrogates is a slick sci-fi mystery from director Jonathan Mostow that takes place in a world where human beings live their lives with little risk due to mechanized humanoid devices that can take their place. But, as is always the case in these kinds of flawless-system movies, something goes wrong. The movie doesn’t chase down the tantalizing implications of its premise as thoroughly as it could have (though, given the barely 90-minute run time, that might have been edited down), but it’s still easily entertaining. It’s the motion picture equivalent of one of those cheap sci-fi paperbacks that can be bought to bring travelers distraction without leaving much impact. The special effects are excellent (especially the weird waxy complexion of the surrogates), as are the well-staged, well-lit action scenes that are often exciting. 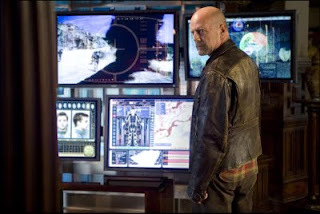 Plus, after all these years, it’s still a pleasure to see Bruce Willis run around fighting the bad guys. The movie's not at all as good as the similarly-themed Minority Report, but it's good enough for a lazy afternoon.